Ransomware is a type of malware attack in which the attacker locks and encrypts the victim’s data and then demands a payment to unlock and decrypt the data. This type of attack takes advantage of human, system, network, and software vulnerabilities to infect the victim’s device — which can be a computer, printer, smartphone, wearable, point-of-sale (POS) terminal, or other endpoint. Phishing email Clicking a link embedded in an email, which redirects to a malicious web page. Social media Clicking a malicious link on Facebook, Twitter, social media posts, instant messenger chats, etc. Malvertising Clicking a legitimate advertising site seeded with malicious code. Infected programs Installing an application or program containing malicious code. Traffic Distribution System (TDS) Clicking a link on a legitimate gateway web page that redirects the user to a malicious site, based on the user’s geo-location, browser, operating system, or other filter. Self-propagation Spreading the malicious code to other devices through network and USB drives. After a device is exposed to the malicious code, the ransomware attack proceeds as follows. Infection: Ransomware is covertly downloaded and installed on the device. Execution: Ransomware scans and maps locations for targeted file types, including locally stored files, and mapped and unmapped network-accessible systems. Some ransomware also deletes or encrypts any backup files and folders. User Notification: Ransomware adds instruction files detailing the pay-for-decryption process, then uses those files to display a ransom note to the user. Cleanup: Ransomware usually terminates and deletes itself, leaving only the payment instruction files. Payment: Victim clicks a link in the payment instructions, which takes the victim to a web page with additional information on how to make the required payment. Hidden TOR services are often used to encapsulate and obfuscate these communications to avoid detection by network traffic monitoring. Decryption: After the victim pays the ransom, usually via the attacker’s Bitcoin address, the victim may receive the decryption key. However, there is no guarantee the key will be delivered as promised. NOTE: Ransomware can remain dormant on a device until the device is at its most vulnerable. Mitigating the threat of a ransomware attack requires implementing both prevention and detection measures. Keep the device’s operating system up-to-date. Regularly back up data to an external hard-drive, using versioning control and the 3-2-1 rule (create three backup copies on two different media with one backup stored in a separate location). If possible, disconnect the hard-drive from the device to prevent encryption of the backup data. Disable Adobe Flash or use a browser (such as Google Chrome) that disables it by default. Don’t click questionable links in an email or on a web page. 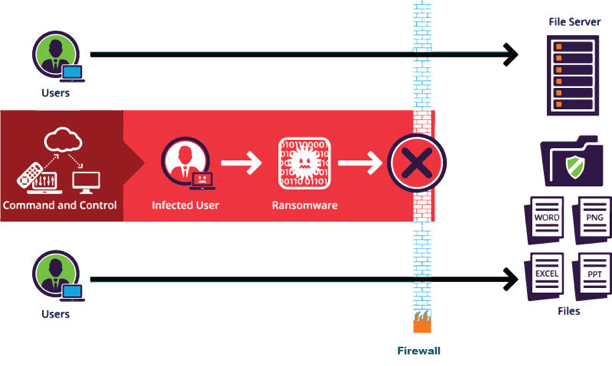 Use real-time alerting and blocking to automate identifying ransomware-specific read/write behavior and then blocking users and endpoints from further data access. Use granular reporting and analysis to provide detailed audit trail support for forensic investigations into who, what, when, where, and how users access files. Learn more about Imperva ransomware detection solutions.